It's been a while since we went on a family walk. Recently we've tended to visit National Trust properties etc. to get the most out of our membership. However, this week we thought we'd just like a walk. We chose Penn Wood. It's just somewhere we'd heard of. We had no map and no real plan, just thought we'd wander. Our first challenge was to find the woods. There's no designated car park, so we weren't really sure where we were going to park. By chance we stopped at the side of the road to try to establish where we were and found ourselves right by a gate into the Woods! At first we let Little Miss A determine which path to take and at one point she led us through a load of ferns which got thicker & thicker! Thankfully we got through and came out into a really nice clearing. The perfect spot for our little picnic lunch. Whilst Little Miss A was distracted with Daddy, I headed off to find a small area to hide some character magnets I'd brought with us from 'Ben and Holly's Little Kingdom'. 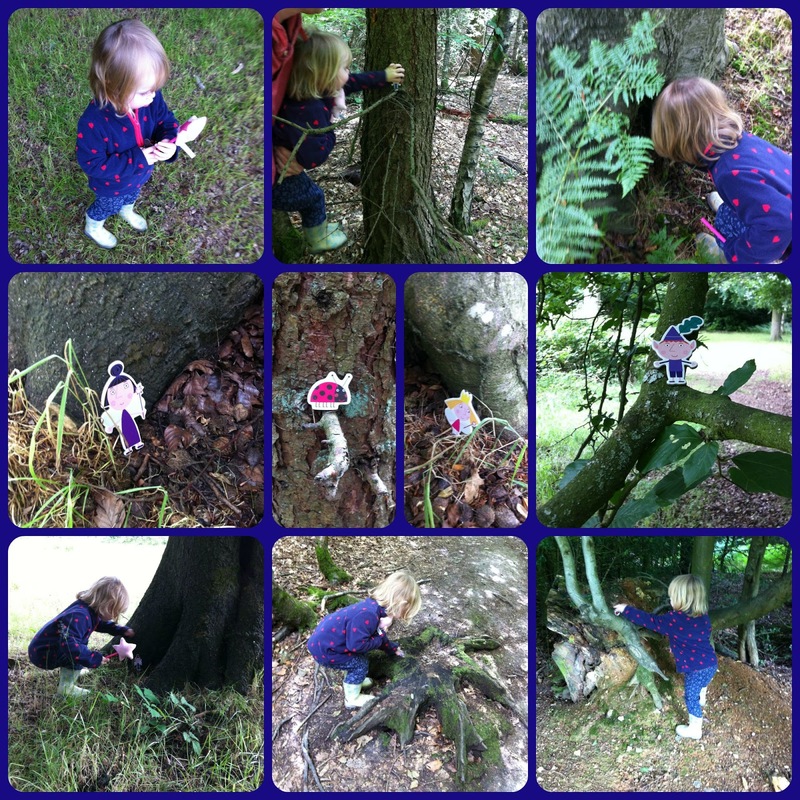 Little Miss A had watched a few episodes in the morning so we'd said we were going on an Elves & Fairies Hunt! Once set-up, we gave Little Miss A her wand and told her if she said a magic spell, the fairies and elves might appear! She loved the little hunt and quickly charged off to find each one. It was a really fun little activity for her! We then set-off again with a bit of log-balancing along the way. 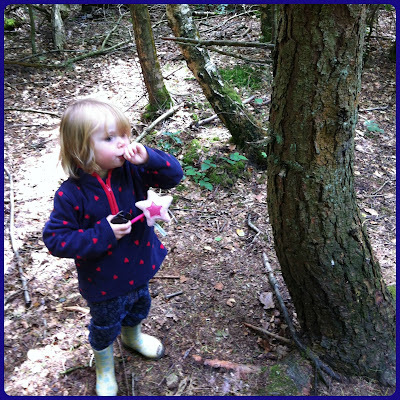 We pointed out the wildlife to Little Miss A and encouraged her to touch different things to feel the texture such as bark and moss. We even encountered a herd of cows which was quite a surprise to find in the middle of the Woods. We did the little fairy and elves hunt for her again towards the end of the walk when she started to flag a little bit. This re-energised her and she was even pretending to blow her horn like Ben does - "I’m an elf" TOOT! On every walk there seems to be a stick that has to be carried the whole way around and there was no exception on this walk. I loved finding the 'A' out of branches - it's amazing what you can find in nature! I can't believe how far Little Miss A actually walked herself. She might have little legs but she can walk miles! It was only towards the very end that she wanted a bit of a carry and enjoyed the view from on Daddy's shoulders. After a good few hours pottering about in the Woods, we decided to call it a day and eventually found our way back to where we had parked the car. We definitely need a map with us next time! 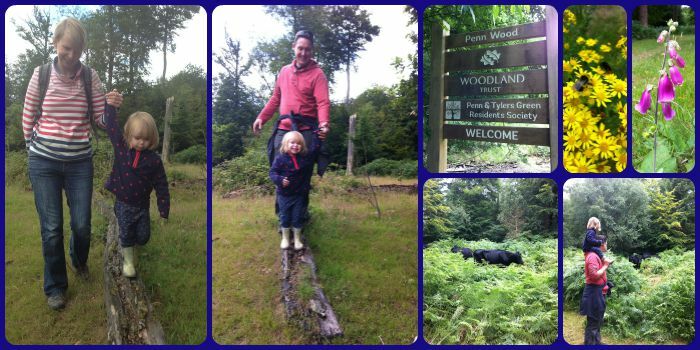 Penn Wood is managed by the Woodland Trust. There's also another wood on the opposite side of the road called 'Common Wood' so we may have to visit that one at some point too. Thanks Susan! Definitely something we'll do again with LO. She loved it! Such a sweet idea! 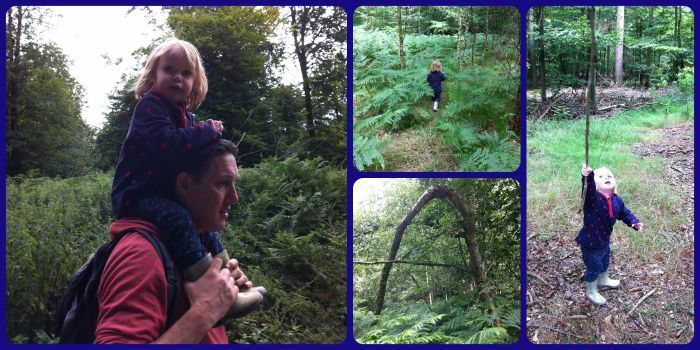 I love woodland walks and this is a lovely way to make it something even more special for little ones. I bet she loved it. Awe, I love the idea of finding fairies and elves! Looks like that made it an even more special walk in the woods. Thanks for sharing at the #LetKidsBeKids link up. Thanks Erin! I think I'm going to have to remember to take these fairies & elves with us on all our walks from now on or LO might be very disappointed! Thanks Sara. It was a really great walk. LO is such a fun age to be out and about with!